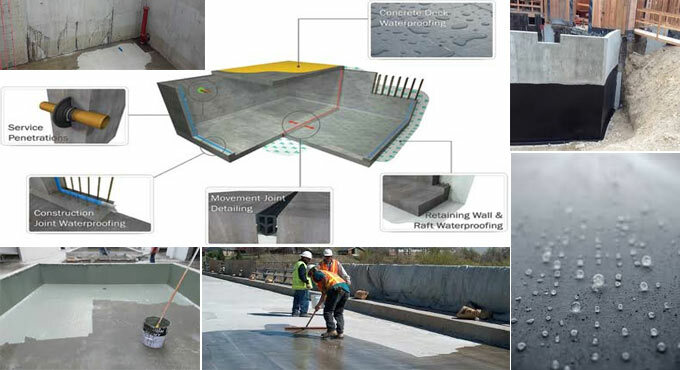 Waterproofing: To safeguard the surface from extreme moisture attack, waterproofing concrete plays an important role. When water penetrates into concrete, the concrete enlarges and contracts because of cycles of freezing and thawing. It leads to cracks and holes. Waterproofing can resolve all these issues. The concrete should be set perfectly so that the waterproofing sealant can be used. To make concrete ready for waterproofing is a crucial step for assuring that the waterproofing sealer functions exactly. Guidance (arrangement for waterproofing): Prior to waterproofing, the new concrete should be cured for at least seven days. Rectify any damaged areas of the concrete. The concrete patching compound should be applied to fill in cracks or holes. With the help of a dry, stiff brush, scrub the concrete to remove any lodged dirt or debris. After that, sweep the concrete with a broom. While waterproofing concrete walls, apply the soft brush attachment on a vacuum cleaner in spite of a broom. The spawl or spall in concrete can be eliminated by using a chipping hammer. If there is a fragmenting, decayed part of the surface, known as spawl or spall, the concrete should be repaired instantly to minimize the spread and expenditure of the work. After that, a thin plaster (2-4mm) is required to conceal the small holes and keep the surface smooth. Methods to repair a concrete spawl: Find out the reason for spawl. Moisture is the common issue. There are other reasons like impact, overloading, exposition to chemicals or extreme water quantity in the original concrete mix. To expand the life of the repair, these issues should be resolved as soon as possible. While placing the new concrete, verify it properly to make sure that the mix comprises of the specific amount of water. Eliminate the damaged concrete. Set a boundary around the damaged area by cutting into the concrete at the depth suggested by the manufacturer of the repair material. Utilize a saw that is specifically created for cutting concrete, like a Hilti handheld gas saw. Cleanse the uncovered surfaces. Sandblast or power wash concrete and reinforcing steel to eliminate all loose materials, dust particles and rust. Vacuum clean. How to feel a small crack with pourable grout: Slash the tip off the grout container to make a hole a little smaller as compared to the width of the crack. Pour in the grout to fill the crack. To deal with deep cracks, pour in the grout one layer instantly and facilitate complete drying among layers. How to fill a bigger crack: To deal with cracks larger than about 1/2 inch (12 mm), apply a mason's hammer along with chisel to split the crack in order that it becomes broader underneath the surface rather than at the surface. This method is known as undercutting. Undercutting resists the patchi material from being displaced due to variation in temperature. Blend vinyl concrete patcher with water as instructed. Press the material into the crack by applying a mason's trowel in layers not in excess of than 1/4 inch (6 mm) thick. Each layer should be fully dried prior to use the next. To fit with the adjacent area, utilize a steel trowel, wood float (a wood block with a handle), broom or brush, finish and texture the surface. The purpose of a steel trowel is to make the surface smooth as well as retain it flat and use a swirling motion.